Michael Reaves/Getty ImagesAfter becoming the second Triple Crown winner in the past four years, Justify’s breeding rights skyrocketed to a record $US75 million, with the horse expected to breed as much as 250 times a year. Triple Crown winner Justify is ready to start the next portion of his career, becoming the most valuable stud horse in the world. Justify’s breeding rights were bought by Coolmore Stud, who paid $US75 million and reportedly hopes to breed Justify 250 times in his first year. Because of his value as a stud, there’s a chance that Justify’s racing career is over, though there are still a few races he could take on later in the year. On Saturday Justify became just the 13th horse in history to win the Triple Crown, defeating yet another crowded field of talented horses en route to adding another win to his undefeated record. 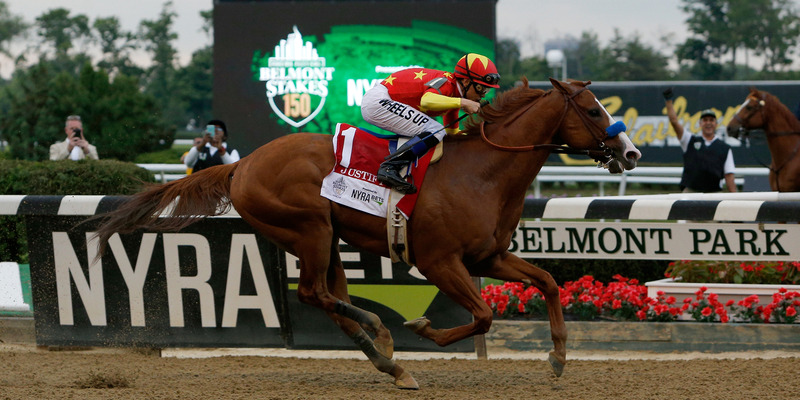 While Justify’s racing career is now up in the air – though Elliott Walden, president and CEO of co-owner WinStar Farm, has hinted at the possibility of future races – the next chapter in Justify’s professional career is set to begin, after a deal for his breeding rights went for a record $US75 million, according to ESPN’s Darren Rovell. Coolmore Stud had already negotiated for a $US60 million deal, but Justify’s Triple Crown win was worth a $US15 million bonus, turning the breeding fee into a record breaker. Justify was purchased as a yearling for $US500,000. After not racing as a two-year-old, he now has an undefeated record and is a Triple Crown champion – his jump from grand potential to richest horse in racing happened all within the past six months. Coolmore’s $US75 million investment is quite substantial, but the company has a plan for how to get it’s money’s worth – Rovell writes that Justify could potentially be looking at breeding 250 times in his first year as a stud, for the cost of $US150,000 per live foal. Justify’s breeding rights far outpaced those of American Pharoah, who became the first horse since 1978 to win the Trible Crown back in 2015. Justify is still the fastest horse on the planet, and could potentially win more prizes on the track at the Travers Stakes or even the Breeder’s Cup later in the year. That said, Justify is now worth more as a healthy stud than he could ever make on the track, so don’t be surprised if his racing career has come to an end.